Figures like this were placed in tombs to represent the dead persons’s family and servants. 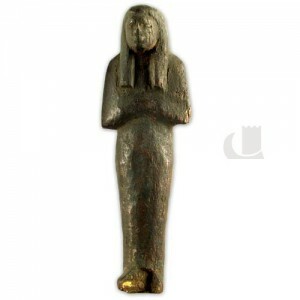 This 18th Dynasty (1,450-1,372 BC) figure is carved from wood. It was recovered from Aswan in Egypt by Sir Francis Grenfell (of St.Thomas, Swansea) and was gifted to Swansea Museum (via the Royal Institution of South Wales) in 1884.